Greensboro, NC—The casseroles, pies, and trays of less traditional Thanksgiving fare—yellow rice and peas and steaming black beans—covered three tables at the back of the assembly hall at First Presbyterian Church here last Monday night for a welcoming feast held every year for immigrants and refugees. But this year those who gathered came with an urgent message. In spite of what North Carolina’s governor, Pat McCrory, and the city’s congressman Mark Walker have to say, many in Greensboro welcome Syrian refugees. “We want to bring thousands of Syrian refugees to the United States and hundreds to Greensboro,” said Zane Kuseybi, an engineer who volunteered with his wife last year to help resettle a Syrian refugee family of seven. About 50 others joined him on stage, among them a rabbi, the outgoing president of the Islamic Center, a Baptist minister, a city councilwoman, the director of the local refugee resettlement agency, and an English professor at Guilford College who has pushed her college and others to provide temporary housing for refugees. In 2014 and this year, 56 Syrian refugees have been resettled in North Carolina, 18 in Greensboro, 24 in nearby High Point and Winston-Salem and 14 elsewhere. In addition, 550 Iraqi refugees have also settled in North Carolina. Life hasn’t been easy for refugees here, but with help from volunteers, like the Kuseybis, they are settling in. They are eligible to work almost immediately and have found jobs in local factories and restaurants. Their children are enrolled in public school. And, until recently, they felt welcome. Then came the terrorist attacks last month in Paris. McCrory was among the first of more than 30 governors to call for a suspension in the resettlement of refugees from Syria and in some cases Iraq. Four days later, the House of Representatives, with Walker joining the rest of the GOP, passed a bill that effectively suspends the resettlement of 10,000 Syrian refugees. Democrats, too, joined in, with 47 voting for the measure in the House. In North Carolina, Attorney General Roy Cooper, the leading Democratic candidate for governor, also called for a pause in refugee resettlement. None of this sat well with those gathered in the church hall. She said that her organization, one of nine under contract with the government, will continue to resettle Syrian refugees, even in states where governors have called for a halt. Her agency expects six families this week, and Ivory is waiting to see whether state governments will try to deny benefits for them. The American Civil Liberties Union has already filed suit on behalf of a family of three who were headed for Indiana and went instead to Connecticut after Governor Mike Pence said he would close his state to Syrians. The lawsuit seeks to prevent him from denying benefits to Syrian refugees in Indiana. Greensboro has a long history of welcoming refugees, beginning with the resettlement of Montagnards from Vietnam in the 1970s and 1980s. Last year, Church World Service resettled 234 refugees here from 11 countries and 30 ethnic groups. Many in the church hall attributed that welcoming spirit to the city’s Quaker roots and its religious diversity. 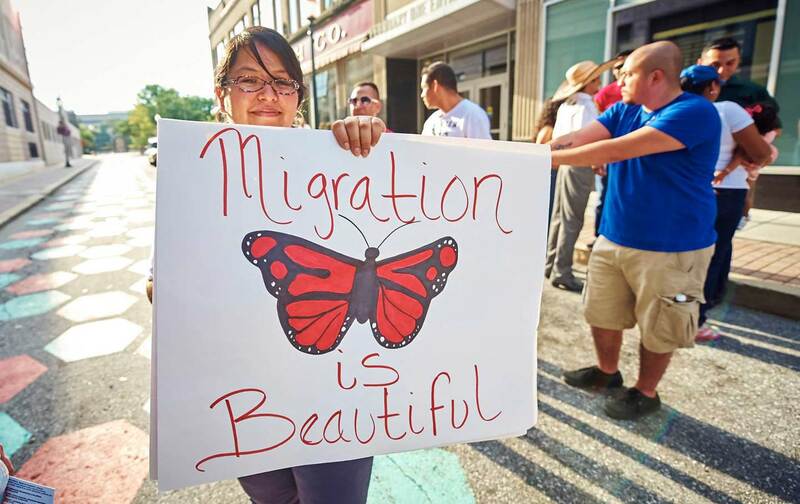 Ivory, until recently the director of refugee services in the Greensboro office, said that there are many communities around the country like Greensboro, whose voices have been drowned out by the fear mongering in the wake of the Paris attacks. “Being in this room is special, but it’s not unique,” she said. I had hoped to see the Al Haj Kasems, the family I interviewed last year, but like the other refugees in the area from Syria and Iraq, they didn’t show. Resettlement workers last Monday said that the Syrian and Iraqi refugees they work with have decided to lie low. “They’re hearing the rhetoric and they’re afraid,” said Andrew Timbie, the director of local branch of World Relief, with offices in High Point and Winston-Salem. His office has resettled six Syrian families and is expecting more. The Al Haj Kasems had fled to Jordan with four children in the early days of the Syrian civil war and filed immediately for refugee status. A fifth child was born in Jordan. They told me last year about the series of interviews they went through, first with the United Nations High Commissioner for Refugees, then with the International Organization for Migration and finally with the State Department, before they were cleared for resettlement in Greensboro. The process took about two years. Kuseybi took the politics of the previous week personally. He and his wife, Lana, both first-generation Syrian Americans, were moved to volunteer last year after seeing images of the carnage and misery in Syria. They spent much of their spare time working with the Al Haj Kasems, raising money for clothes and a used van, collecting hand-me-down furniture from friends, arranging appointments with doctors and the Department of Motor Vehicles, and perhaps, most importantly, offering friendship. They read to the family’s 7-year-old daughter, watched as the baby learned to walk, and laughed with the adults over sweet, Turkish coffee. The US Senate is expected to vote this month on its own version of a refugee bill. We’ll see then whose voices win out. Phoebe ZerwickPhoebe Zerwick is a former reporter and editor at the Winston-Salem Journal and a lecturer in the English Department at Wake Forest University, where she teaches writing and journalism.